Connects your computer to USB 3.0 peripherals. This USB SuperSpeed cable allows you to connect hubs and peripherals such as printers, scanners, and storage drives. 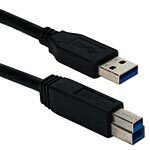 It is USB 3.0/3.1 GEN1 compliant, has braid shielding and supports speeds up to 5Gbps. Only works with USB 3.0 devices.